Airmen scheduled to PCS to Minot Air Force Base this summer are being told to remain where they are unless they’re technical training grad uates or single with no dependents. 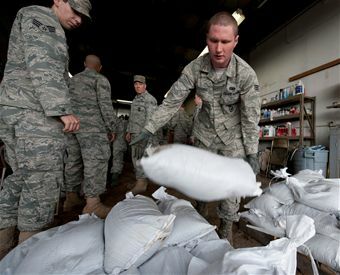 Air Force officials issued a partial stop movement order back in June because of heavy spring flooding that forced thousands to evacuate. The flooding damaged a lot of the available off base housing. After reviewing the situation on the ground officials have decided to keep the stop movement order in place, according to Minot AFB public affairs. Only service members who are technical training graduates and accessions who are single with no dependents will be allowed to proceed to Minot. Those who are married or who have dependents must sit tight. Service members stationed overseas who have a July date eligible to return, who were not authorized to proceed, are being diverted to a new assignment location, according to public affairs. Those with an August eligibility date will be reviewed to determine who will be allowed to proceed to Minot. Those who are not authorized will be able to request a voluntary 30-day extension. If they do not choose to voluntarily extend, assignment diversion actions will be taken. Servicing personnel sections or force support squadrons will communicate each airman’s decision to AFPC. Airmen other than training graduates and accessions will be allowed to proceed to Minot AFB on a case-by-case basis. Civilians with PCS orders to Minot AFB should not depart their losing base until notified by personnel authorities. Civilians returning to Minot AFB from leave or a temporary duty assignment are authorized to return. Civilians slated for a temporary duty assignment to Minot AFB must get host unit approval before traveling. For more information about the stop movement, affected military members should contact their military personnel section, or call the AFPC assignment programs and procedures branch at 210-565-3815, or the 24-hour contact at 210-565-2020. Civilians affected can contact their local civilian personnel section, the 24-hour number above or call the POC at 210-565-5737. For more information about other personnel issues, visit the Air Force personnel services website at https://gum-crm.csd.disa.mil.